Car hires, also known as car rentals, will make your trip to Ireland all the more enjoyable. Rather than using public transportation or relying on tour buses to take you from place to place during the majority of your stay, hiring a car gives you tons of flexibility to plan your trip the way you want it. While having a vehicle to drive around while in the country is ideal, it can actually be one of the most frustrating parts of planning your trip if you do not know what is required. There are several different rules that you must follow and insurance that you must acquire before hiring a car. Rules may vary from country to country. To hire a car in Ireland, you must select an insurance company or check with your current company to obtain the necessary extras that you must have. To rent, you will need to have the Collision Damage Waiver extra on your insurance. This will cover the vehicle in the event of an accident or theft while in Ireland. In addition to this fee, car hire companies may require you to pay a deductible of anywhere from €500 - €1,000. Super Collision Damage Waver packages are also available for a daily fee. When paying more for this type of insurance, there are typically no fees required if the vehicle is stolen or damaged during your rental period. Third Party Liability Insurance is also mandatory when renting a car in Ireland and should be included with the rental. 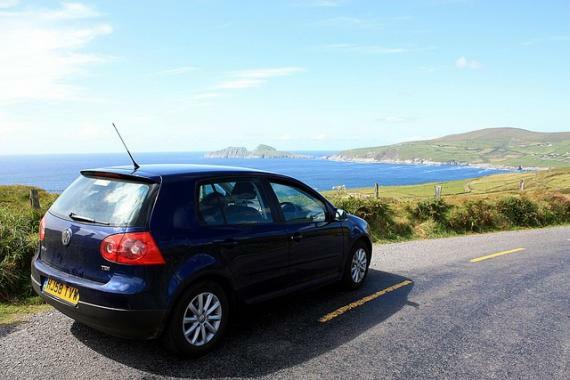 After ensuring that you meet all of the necessary insurance requirements to take advantage of car hire in Ireland, you will need to decide where you pick up the vehicle at. One of the most popular places to secure a rental is right at the airport. Car hire companies can be found at all major airports throughout Ireland and are typically found near the baggage claim area. Car hire companies are also available in towns and cities for those looking to obtain a rental after arriving. There is no right or wrong car hire company. Each company may offer different perks or discounts for different individuals. Before hiring a car, shop around and do your homework to find the best offers. Popular car hire companies in the country include Atlas Car Hire, Dan Dooley Car Rental and Budget Car Rental.